Today, we are excited to announce a strong partnership with Kucoin, MultiVAC will be the first launched project on Spotlight, a new premium asset platform. It is very worth looking forward to, click here to view the announcement of KuCoin Spotlight. MultiVAC is a pioneering flexible blockchain platform for all-dimensional sharding for not only computation but also transmission and storage, maximizing throughput while maintaining decentralization and without sacrificing security. Since MultiVAC launched in May last year, it has received high expectations, evaluations and enthusiasm from capital and markets, long time in the top list of major rating media. KuCoin Spotlight is a new premium asset platform recently launched by cryptocurrency exchange Kucoin to launch crowdfunding capital for early blockchain projects, bringing together market concerns and enhancing industry influence. Kucoin is a globally crypto exchange based in Singapore, which has a large number of users worldwide, offering over 350 trade pairs. In last year’s lab testing, MultiVAC reached at the peak of 30,784 TPS in a network comprised of 64 shards and 12,800 nodes, the whole network also achieved perfect linear scalability. In February 2019, MultiVAC released the world’s first all-dimensional sharding solution testnet “Phoenix”, which also signals that the all-dimensional sharding solution was completely enforced, and the high-performance blockchain transaction, storage, and transmission have become a reality. And MultiVAC has obtained strategic investment from top international organizations including IDG, Hashed, NGC, UniValues. MultiVAC is grateful to investors for their strategic support and assistance, and thanks for their recognition of the long-term value of MultiVAC. Although the cryptocurrency market is still in a bear market, but more and more solid blockchain protocol projects are emerging and coming into the public eye. 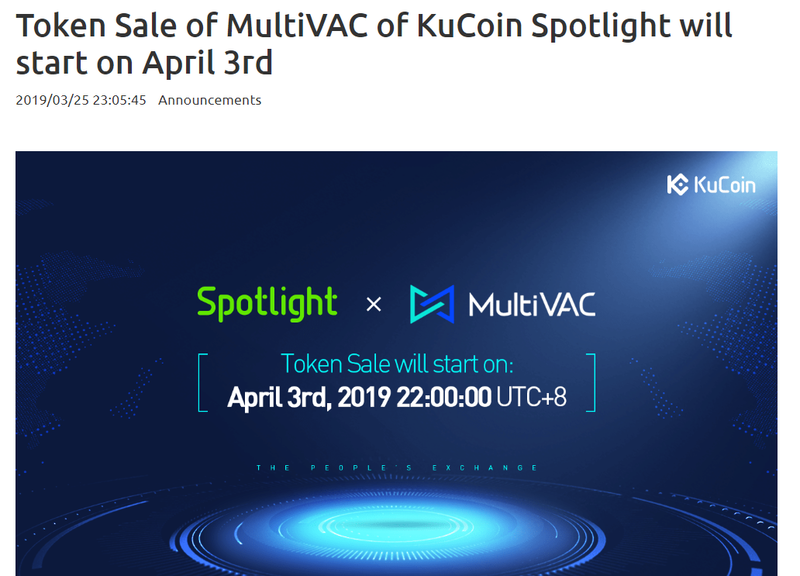 MultiVAC became the first project of KuCoin Spotlight, which is a major milestone for both partners and an important new starting point for the development of the blockchain industry in 2019. Just like Spotlight’s Chinese meaning, for us, this is an opportunity to present MultiVAC’s advanced blockchain concept to the world, focusing on true technological innovation. In addition, MultiVAC’s slogan is “Let there be light”, and we hope that with the spotlight platform, we can really bring a light to the blockchain industry. Click here to view the announcement of KuCoin Spotlight. KuCoin Spotlight sales token is designed to provide working capital for start-up innovative blockchain companies to further develop the underlying systems while helping them use and circulate cryptocurrencies. For the sale of MultiVAC, participants should be wise to participate and understand the risks involved. KuCoin Spotlight is the only officially designated platform for MultiVAC. We do not allow any form of proxy investment. MultiVAC will never contact you through private means. Please beware of fake MultiVAC admins, LinkedIn accounts, and emails, as well as fake MultiVAC Websites and spreadsheets, etc. Please let us know if you find them.